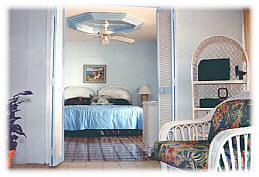 Directly on the beach on St. Croix, USVI! Luxurious and spacious "Caribbean blue" is our 2 bedroom 2 bath Condominium with full kitchen, A/C, W/D and a view that most only dream of! Comfortably sleeps and lives up to four. 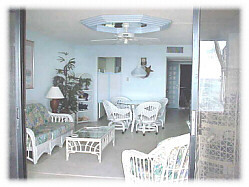 Refurnished and redecorated Feb 2000, "Caribbean Blue", located on Sugar Beach one of St. Croix's best sugar-white beaches is the most effective place to maximize your vacation dollars. 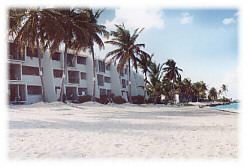 All resort facilities included, freshwater pool, 2 lighted tennis courts, pristine beach and manicured grounds will make your stay a "True Vacation Paradise". Spacious living areas tastefully finished in the tranquil colors of subtle blues providing a soothing calm that changes appearance with the passing time of day, capturing and enhancing the turquoise view of the Caribbean Sea as the focal point from throughout. Mirrored ceiling accents rival the finest hotels. Tasteful and comfortable furnishings including decorations are in the Caribbean flair yet with an at home feeling in a resort atmosphere. Features: Full Service Kitchen, Washer, Dryer, Central air-conditioning, Ceiling-Fans, Phone, Cable Television, Stereo, and over 1400 SF of space. Sugar white beaches, Turquoise waters and endless blue skies all meet for your private view from the expansive 30' Gallery! Fast food, groceries and spirits are minutes from the complex grounds for the non-adventurers. 20 minutes from the airport and located just 5 minutes outside of Christianstead, "Caribbean Blue" on Sugar Beach offers superb convenience to duty free shopping, water sports and dining that is among the best in the Caribbean. From your daytime adventures to the nightly entertainment or a visit to the newest and finest Caribbean Casino "Divi Carina Bay" your stay will be unforgettable. 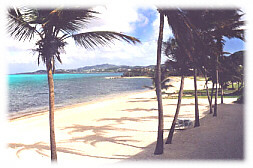 St. Croix is the largest of the Virgin Islands, 82 square miles, and the eastern part of the Island is the eastern most point of the United States. St. Croix offers fantastic beaches to the extremes of environmental terrain for visitors to explore. Your days can be filled with a variety of adventurous and leisurely activities. If your not enjoying the beach, free formed fresh water Pool or 2 Lighted Tennis courts then Fine Restaurants and Duty-Free-Shops are minutes away. Diving, Snorkeling, Sailing, WindSurfing, Deep-Sea-Fishing and Diving, Horseback-Riding, Rain forests, Botanical Gardens, Reefs, Ruins and Buck Island are some of your adventures to experience. Wash up on our sandy shores, find all the treasures that St. Croix has to offer. Four Single Beds easily are converted to two King size beds to accomadate your sleeping pleasure. 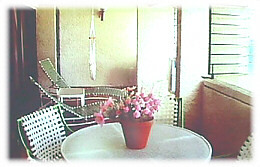 30' balcony directly off the livingroom and master bedroom opens to a fabulous view of the beach and ocean. Inquire about Owners "Special Discounts"